This weekend the racist Europe-wide Generation Identity (GI) network, dubbed 'Nazi hipsters' by anti-fascists, are descending on London for a conference meant to establish their presence in the UK. Young far-right activists from all over the continent are expected in the city for a weekend of activity which is set to start on Friday evening and conclude on Sunday. Austrian GI co-leader Martin Sellner, who was recently banned from UK and held in an immigration detention centre for three days, is attempting to enter the country again. Sellner is due to arrive at London Stansted airport at 19:15pm on Friday and is asking his supporters to gather at the airport, either to hear about him being denied entry or to welcome him to the UK. Sellner was originally denied entry to the country because of his involvement in GI, which wants to see a white-only Europe created through ethnic cleansing, which it calls “remigration”. Sellner was due to speak at Speaker's Corner in Hyde Park after a meeting with UKIP's youth wing was cancelled after pressure, the second time this has happened in the past year. Sellner and his alt-right vlogger girlfriend's detention sparked a number of far-right protests at Speaker's Corner and the area has now become a focus for anti-Muslim hatred, masquerading as being a campaign for free speech. The conference on Saturday is being held between 10am and 5pm at a secret venue somewhere in the greater London area. Anti-fascists from @OpposeGI are claiming to have secured a ticket to the event and the venue is expected to be released on theirs and London Anti-fascists' twitter accounts as soon as GI inform attendees of where the conference is being held. As soon as the location of the conference is made public anti-fascists will head to the venue, hoping to shut the conference down. Speaking at the conference are a number of leading GI organisers from across Europe. Annika Franziska, the co-founder of German GI front #120db; Ábel Bódi, the co-leader and spokesman for the Hungarian GI branch and Lorenzo Fiato, the spokesman for the Italian GI branch are all scheduled to speak, along with Sellner if he makes it through the UK border. Also due to address the conference are Damhnait McKenna, the public face of GI in Ireland and former squaddie and child boxer Charlie Fox from Eltham, South London. Fox, who uses the surname Roberts for his far-right political activity, is credited with helping build GI's UK presence. Scouser Jordan Diamond, who uses to pseudonym James Windsor, was the public face of GI in the UK but is not listed to speak. Diamond was caught on camera denying the scale of the Holocaust after GI's initial meetings were infiltrated by a reporter and has kept a low profile since. The conference is being chaired by Norwegian Tore Rasmussen who has been in charge of building up GI's UK presence. Rasmussen is a successful entrepreneur who holds director positions on a string of businesses based in Norway. Rasmussen has recently announced he's become the UK & Scandinavian manager for Phalanx Europa, the GI-linked merchandise store. On Sunday, many of the conference attendees will head to Speaker's Corner to hear Franziska speak about the #120db campaign. This is an attempt by GI to co-opt the #MeToo movement and reinforce their argument for ethnic cleansing by cherry picking incidents of sexual violence by migrants. In response the Anti-Fascist Network will be giving a talk about the kinds of violence all women face, with anti-fascists and feminists gathering at Speaker's Corner from 10am on Sunday. GI are one of the fastest growing far-right groups in the UK and are filling the gap left by banned neo-Nazi terrorists National Action (NA). Many ex-NA activists have indicated their support for GI on social media and former NA member Jacob Bewick from Sheffield even joined GI. Since launching in the UK in October GI have had a difficult time as the initial strategy meetings were infiltrated. Sellner, who was in London to address an extreme right-wing meeting attended by neo-Nazis, was caught on camera using the term “P*ki” and discussing the “Jewish Question” and “Muslim Question”. The revelations in ITV's Exposure documentary meant GI's growth has been stunted, but a wave of activism and events have helped the group to overcome these difficulties. The main strategy GI is following in the UK is trying to inject ethno-nationalism into the counter-jihad movement. The network has close links with former EDL leader Tommy Robinson who has produced propaganda for them on his YouTube channel and recently read a speech by Sellner after he was banned from entering the UK. One of the ways GI have tried to push their ideas has been by giving out warm meals containing pork to white homeless people. This is a technique copied from GI in France where they would hold 'sausage and wine' protests in public squares to deliberately alienate Muslims and Jews. GI have also been making forays onto university campuses, recently filming themselves doing a banner drop at Birkbeck student union which they claimed was in response to calls to decolonise philosophy reading lists at SOAS. These visits are part of an attempt by GI to recruit racist university students who can be indoctrinated into their white-only group. SOAS has been targeted by GI on several occasions over the past few months and stickers have appeared on other campuses. But attempts to organise at universities could be about to backfire - a lot of students are expected to join the anti-fascist protests over the weekend, telling GI they're not welcome in London. Sunday: Speaker's Corner: Anti Fascist Feminism! 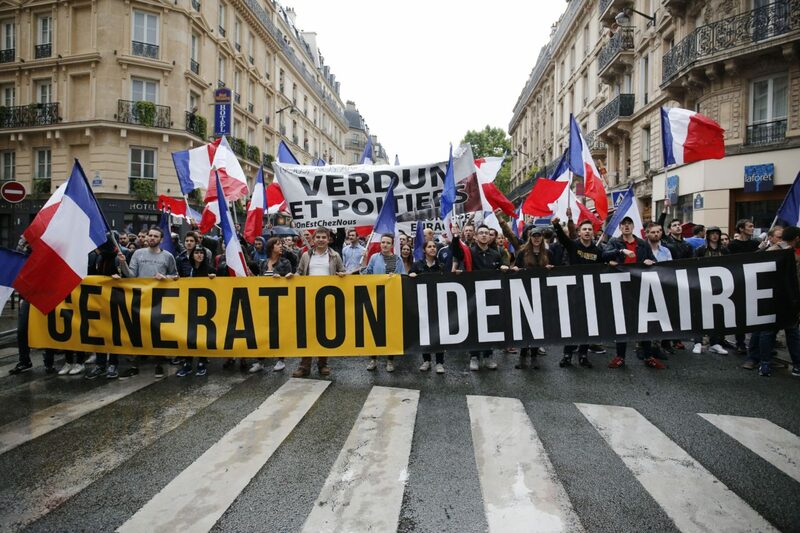 Generation Identity wants to see a white-only Europe created through ethnic cleansing, which it calls “remigration”. So, what happened with this? so well done to everyone who went to oppose them.